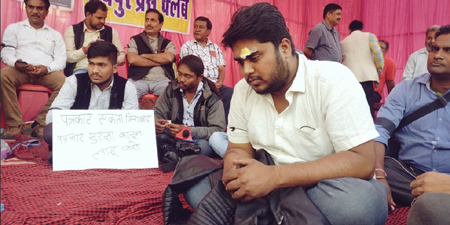 Journalists Suman Pandey (pictured) and Vinod Dongre were attacked as they covered a meeting of officials from the ruling Bharatiya Janata Party (BJP) in Raipur, Chhattisgarh on February 2. The International Federation of Journalists (IFJ) and its affiliate the Indian Journalists Union (IJU) have strongly criticized the attack and demand an immediate investigation into the incident. Pandey, a journalist with The Voices, filmed a scuffle that broke out between BJP officials. He said that he was attacked and beaten by BJP officials, demanding that he delete the footage. Vinod was also injured in the attack. Pandey, who sustained head injuries in the attack, filed a complaint to the police. In the complaint, he said that BJP Raipur President Rajiv Agarwal, Vijay Vyas, and Dina Dongre were the officials who attacked him. Late on Saturday all four of the assailants were arrested under Sections 342 (wrongful confinement), 323 (voluntarily causing hurt), 504 (criminal intimidation) and 34 (common intention) of the Indian Penal Code, and released on bail.